Lion Brand Cupcake Yarn - Happy Dance - Lion Brand-Cupcake Yarn. 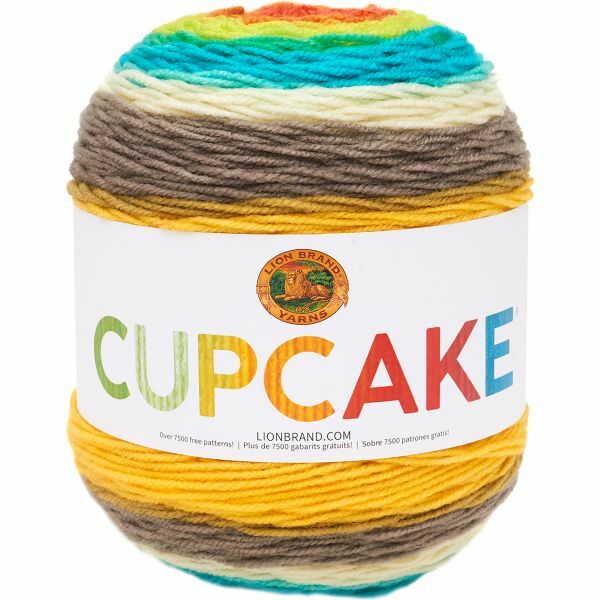 Just like its name, everything delicious is in one cake of this CYC 3 100% acrylic yarn. Beautiful color combinations, great stitch definition and enough yardage to make a baby blanket, shawl, or hat and cuff set. You will want to collect every color way. Content: 100% Acrylic. Putup: 5.3oz/540gr. 590yd/540m. Gauge: 22sx30r = 4in/10cm on size US5/3.75mm knitting needles. Suggested crochet hook size USH8/5mm. Dyelotted; we try but are not always able to match dye lots. Care: machine wash, machine dry. Comes in a variety of colors. Each sold separately. Imported.